The Amish Hampstead Sheaf Back Swivel Bar Stool brings an early American style to your kitchen counter or bar area. The defining characteristic is the artwork involved in the chair back that resembles a bundle of golden wheat. This solid wood sheaf back display is a testament to the exceptional quality of Amish woodworking and complements a French Country look with ease. Available in oak or cherry wood, these custom bar stools will become a favorite seating option at your kitchen counter. The swivel option allows easy movement and makes sitting at the counter more comfortable. Amish made furniture allows you to customize to create the furniture you envision. Select the wood and stain of your choice for these Amish bar stools and consider either the decorative turned leg or a straight leg option. The solid slender stretchers on the front of the stool provide even more comfort with a place to rest your feet. 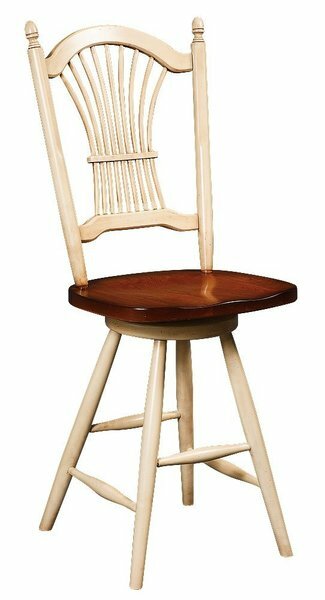 Take a look at our collection of Amish Bar Stools and Counter Chairs to see all the styles we have to offer. Consider an Amish Home Bar to create a relaxing space for your family to enjoy. Call one of our Amish Furniture Specialists today, toll-free at 866-272-6773 with any questions or visit our DutchCrafters Furniture Store in Sarasota, Florida to experience our Amish furniture in person.